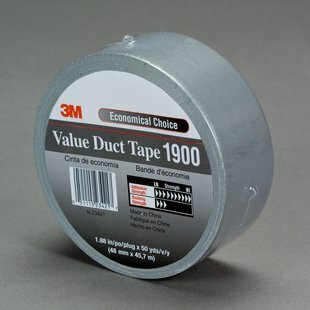 3M™ Value Duct Tape 1900 is a good general application duct tape. It is useful for tasks such as sealing, bundling, marking, and temporary repairs in applications that are not critical. The synthetic rubber adhesive sticks on contact to smooth metal, glass, plastic, sealed concrete and more. The water resistant polyethylene coating seals well in moist and humid environments. Silver polyethylene backing over cloth scrim resists moisture, which allows for reliable performance in moist or humid environments. The synthetic rubber, pressure-sensitive adhesive sticks to glass, metal, plastic, concrete and more. Surface is ideal for labeling with markers. Tape tears away from the roll easily, by hand. Convenient to use. Individually wrapped for easy identification and to keep the rolls clean.